The Aging Cure, is a guide to make anti-aging effortless so you can look and feel younger. The solution is a diet that avoids hidden sugars and is rich in antioxidants. 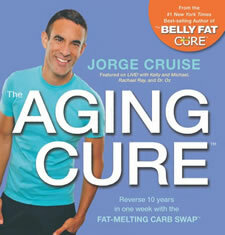 Its author, Jorge Cruise, was once forty pounds overweight but today he is an internationally acclaimed diet expert. He is also a New York Times bestselling author of a series of diet books including the “Belly Fat Cure” and the “Three-Hour Diet”. Cruise says that excess weight is the main reason why we age and begin to feel sluggish. He claims that you can make yourself look ten years younger in just one week on his anti-aging eating plan. You will learn to replace high-sugar foods with low-sugar, antioxidant rich alternatives. This will enable you to lose weight, feel more youthful and reduce the visible signs of aging. The foundation of this program is the FAT-MELTING CARB SWAP, which is a system to help you avoid hidden sugars. It also utilizes the power of antioxidants to revive the appearance of your skin and restore your health. All of these plans are designed to help you create healthy eating habits that will reduce your risk of disease and increase your lifespan. To get the best results Cruise recommends you start with his one-week challenge and follow these menus exactly. After you have completed the first week you will continue to keep your daily S/C ratio no more than 15/6. You also have the option to continue following the meal plans after the first week. Simultaneously you can begin to adjust your food options based on the 15/6 formula. If you reach a plateau or want to lose weight quickly for a special event you can follow the “Faster Results” menu. Each recipe has an S/C value of 5/2 or less. This makes it easy because you can choose any three of these meals each day and maintain a value of 15/6. Asparagus, broccoli, romaine lettuce, spinach, kale, eggplant, onion, blueberries, strawberries, avocado, coconut, almonds, flaxseeds, pumpkin seeds, walnuts, eggs, turkey, salmon, chicken, cheese, roast beef, whole-wheat bread, whole-wheat pasta, steel-cut oats, quinoa, chickpeas, basil, cilantro, ginger, turmeric, dark chocolate, coffee, green tea, red wine. Cruise asserts that the real cause of weight gain and accelerated aging is hidden sugar. Nevertheless he encourages regular exercise for its health benefits. The book includes descriptions of exercises that you can do for five minutes each morning. These movements will help increase bone density, enhance circulation, build muscle for an improved physique and boost your energy. You can also do twenty-minutes of power walking each morning to melt away body fat. The Aging Cure: Reverse 10 years in one week with the FAT-MELTING CARB SWAP retails at $19.95. May help to reduce the visible signs of aging and the risk of disease. Includes seven-day menus for six different diet preferences. Provides lists of recommended brands of grocery items such as bread, cereals, condiments, cookies, candy and beverages. Only requires five minutes of exercise a day. Requires counting the intake of sugars and carbs. For the first week of the diet it is necessary to follow a strict meal plan. Limits the consumption of fruit to only one or two servings per day. Some dieters may require more physical activity to successfully manage their weight. The Aging Cure limits the intake of hidden sugars while emphasizing foods high in antioxidants. Whether you can look ten years younger in just one week is debatable. However, over time this way of eating will probably help you lose weight, improve your appearance, and enhance your health. Cruise, J. (2013). The Aging Cure: Reverse 10 Years in One Week with the Fat-melting Carb Swap. Hay House, Inc.